Many people wouldn’t consider their job to be what they “really do.” Even in the best of circumstances, who hasn’t dreamed of leaving their daily life behind for a new adventure? Moonlighter is a new action RPG that imagines a video game character having this real-world conflict. Moonlighter, released today for PC, Xbox One, and PS4, stars ,Will, a shopkeeper in the small town of Rynoka who longs to be an adventurer. By day, you run a store (the titular Moonlighter) selling bric-a-brac to the townspeople. By night, you delve into changing dungeons to find goods to sell, murdering a lot of monsters along the way. Each of the game’s five dungeons has three floors, with a boss at the end; besting a boss unlocks a new dungeon, leading up to a final battle. 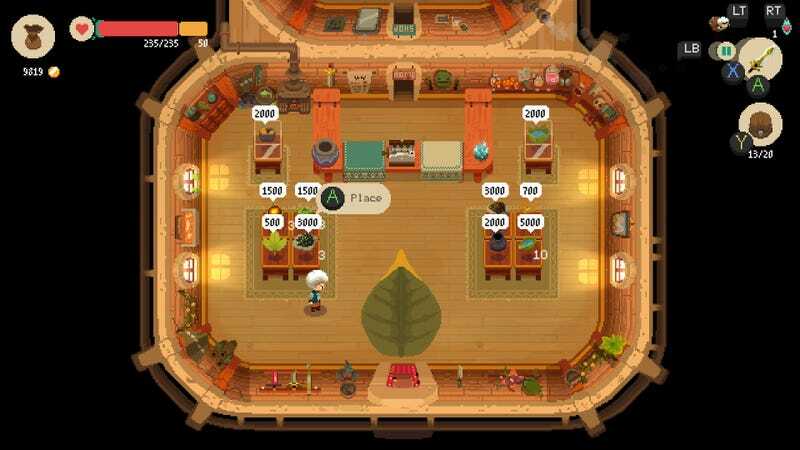 Moonlighter is basically two different games, with Will’s day job and his dungeoneering connected by loot. The discrete nature of your days and nights demonstrate Will’s personal conflict with how he wants to spend his time, helping the player get a sense for his character without the need for too much dialogue or backstory. While players might gravitate toward one end or the other—I tend to not like shops very much, for instance—it helps that each piece is fairly uncomplicated. There are a lot of features and moving parts to the game, but they’re simple and helpfully explained through in-game notebooks and image prompts. Shopkeeping involves setting up your goods, determining a price, and making sure you’re at the cash register when customers grab something. Customers react to the price you set through pictures that appear over their heads. They’ll smile if something is priced just right, frown if it’s too high, and have coins for eyes if you’re selling for too low. The game keeps track of the numbers you’ve discovered, and it’s pretty easy to get a sense for what each item is worth. You can upgrade your shop to make room for more merchandise, open up the option to take on customer requests, and add decorations that will encourage tips or deter shoplifters. A day at the shop can be hectic, but it’s never overwhelming. I felt tired but energized when the day ended, proud of seeing my money pile up. There’s lots to do with that money. You can upgrade the town to add services like a potion-maker and a blacksmith. You’ll need these people to craft weapons, armor, and health potions, as well as upgrade your gear. Upgrades get pricey fast, and even staples like health potions will start to cost you if you aren’t careful, making smart pricing at your shop all the more important. The amount of money you need scales well, making it tough but not too taxing to afford the upgrades you need even as they leap in price. In my time with the game, neither new vendors nor my improved shop never quite made the town feel like a living place, but I enjoyed the routine of closing my shop and running my errands before setting out for my nightly dungeon runs. Each dungeon has a theme, such as forest or desert, set apart with unique looks and their own excellent soundtracks. Enemies get new looks but remain mechanically similar throughout. You’ll always have hordes of little slimes it’s easy to forget about until they’re swarming you, or enemies that roll toward you. Combat is compelling but never too tricky. I found my biggest challenge to be spatial awareness—not getting mobbed or rolling off a cliff. It helps that you can teleport out of the dungeon and end your run at any time, even conjuring a portal that you can return to later. Since you lose the items in your bag upon death, this latter ability is especially helpful for popping home and storing your loot before taking on the final boss. Unlike in the shop, managing my loot in the dungeons felt a bit tedious at times. Monsters drop loot, and there’s also loot to be found in chests once you clear a room. Your inventory is very limited, and it’s made more so by certain items that have unique qualities. Some items will destroy the thing below them when you go back to town. Some can only be placed on the top or bottom of your bag. Others will turn items near them into themselves, a great option for turning junk into valuables, but less great for late in a run when you’re stocked with expensive scrolls and books. As with everything in Moonlighter, none of this is complicated, but having to do inventory management on top of shopkeeping, gear-crafting, and combat felt like one more system in a game a little too full of them. This might be Moonlighter’s one flaw: There’s just too much going on. Throw in a Spelunky-style dungeon timer and Binding of Isaac-esque secret rooms, and it can all start to feel unwieldy. However disparate each of Moonlighter’s many pieces might feel, the game adheres to simplicity in a way that ties everything together. As well as simple mechanics, this extends to its bright art style, which is simple but lovingly detailed—fireflies glowing in the town square, Will’s outfit changing based on his gear, animated monsters that are both adorable and creepy. The game’s many pieces all work, creating a game I found myself sinking hours into, telling myself “just one more day” every time I meant to log off. As I played on PC I kept thinking about the Switch version, which should be out this summer, and how good Moonlighter will be on the go. Once I can take it with me, though, I might never put it down.